Nagarjunasagar, a massive irrigation project on the River Krishna, has a rich and interesting past. It was a valley in the Nallamalai range of the Eastern Ghats with civilizations dating back to thousands of years. Recorded history, however, assigns the first signs to the later Satavahanas and subsequently the Ikshvakkus in the third century. The tallest masonry dam in the world, Nagarjunasagar stands some 124 metres high, creating the largest man-made lake with a capacity of 11,472 million cubic metres. The waterspread of the reservoir is about 380 Sqkm. Jawaharlal Nehru called Nagarjunasagar a “modern temple”. The Sriparvata and Vijayapuri of yore were really temples where th e famous savant and Buddhist disciple Acharya Nagarjuna preached the message of the Buddha. Nagarjunakonda: As the area was threatened with submergence by the reservoir the Archaeological Survey team made determined efforts to virtually transplant nine monuments from the valley onto Nagarjunakonda (the Hill of Nagarjuna) where they stand now in almost the original form in which they were found. While most of the monuments were relocated at Nagarjunakonda, the hill that now forms an Island in the middle of the reservoir, the smaller ones wee put at Anupu on the eastern bank of the river. 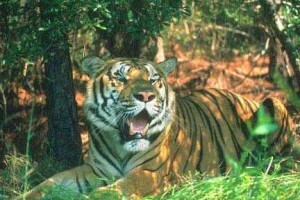 Tiger Sanctuary: The largest wildlife sanctuary in Andhra Pradesh lies between Nagarjunasagar and upstream Srisailam. Spread over 35,000 sq km, it encompasses thickly wooded hills in five districts – Nalgonda, Kurnool, Mahboobnagar, Guntur and Prakasam. Anupa: while the Nagarjunasagar dam was being constructed, excavations revealed ruins of an ancient Buddhist university. As the reservoir would submerge the ruins, the entire site was shifted and reconstructed 4 km away at Anupu near Nagarjunasagar. Ethipothala: 8 km from Nagarjunasagar is the Ethipotala waterfall. This impressive picnic spot has a hill stream Chandravanka cascading down 22 metres to join the mainstream Krishna River. The waterfall has created a beautiful lagoon below. A crocodile-breeding centre has been located here by the Forests Department. This entry was posted in Andhra Pradesh, Nagarjunasagar. Bookmark the permalink.